b>Spain's Jeong Cheol Kim Shows Off Poomsae Skills in Male Individual Under 65 Final at 9th World Poomsae Championships — Spain's Jeong Cheol Kim shows off his poomsae skills in the male individual under 65 final on the fourth and final day of the 9th WTF World Taekwondo Poomsae Championships at the Olympic Gaymnasium in Aguascalientes, Mexico on Nov. 2, 2014. In the male individual under 65 division, Spain's Jeong Cheol Kim won the gold medal as he earned 7.93 points in the final round. The United States' Chi Duong won the silver medal with 7.49 points. The bronze went to Turkey's Galip Yalcinkaya and Great Britain's Michael Pejic. For Spain's Jeong Cheol Kim, it was his third consecutive gold medal at the World Taekwondo Poomsae Championships. His daughter, Laura Kim Kim, also won her third consecutive gold medal in the female individual under 40 category division at this championships. AGUASCALIENTES, Mexico (Nov. 2, 2014) — Korea showed its supremacy in poomsae taekwondo as it took the overall title with 13 gold medals, one silver and two bronze medals at the 9th WTF World Taekwondo Poomsae Championships in Aguascalientes, Mexico on Nov. 2, 2014. For Korea, it was the ninth of its kind at the World Taekwondo Poomsae Championships. In the overall medal tally, China came next with five gold medals and one bronze medal, followed by the United States with four golds, four silvers and 11 bronzes. Vietnam stood at fourth by winning three golds, six silvers and five bronzes, while the Philippines came next with three golds, two silvers and three bronzes. Host Mexico stood at eighth with one gold, seven silvers and nine bronzes. A total of 25 countries took at least one medal at the championships, which drew 461 athletes from 46 countries for top honors in 36 divisions, including eight freestyle categories. The male MVP in the recognized poomsae division went to Kwang-ho Park of Korea, the gold medalist in the male individual under 30 division, while Olin Yoliztun Medina Lopez of host Mexico, the gold medalist in the pair under 30 category, was named the division's female MVP. Jean Pierre Sabido of the Philippines, the gold medalist in the freestyle male individual over 17 division, was named the male MVP in the freestyle poomsae division. The female MVP in the section went to the United States' Adalis Munoz, the gold medalist in the freestyle female individual over 17 category. The Good Fighting Spirit Awards went to Mauritius, Australia and Oman, while Mexico, Spain and Russia received the Active Participation Awards. Korea's Ki-cheol Lee was named the best coach in the male team, while Vietnam's Minh Khuong Le was selected as the best coach in the female team. 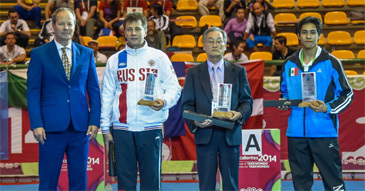 Five international referees were named best poomsae referees of the championships. They were Korea's Dong-jin Lee, Chinese Taipei's Lee Chang Te, Denmark's Edina Lents, Russia's Sergey Y. Proskurnev, and host Mexico's Juan Carlos Jimenez. On the fourth and final day of competition, athletes competed for top honors in nine categories. In the male individual junior final, Korea's Jeong-hyun Cho won 8.5 points for the gold medal, while Peru's Hugo del Castillo Palomino earned 8.41 points for the silver medal. The bronze went to Finland's Frans Salmi and Chinese Taipei's Ching Chen. In the female individual under 30 final, Korea's You-lee Choi earned 8.39 points for the gold medal, while Mexico's Olin Yoliztin Medina Lopez won 8.26 points for the silver medal. The bronze went to the United States and Chinese Taipei. In the male individual under 65 division, Spain's Jeong Cheol Kim won the gold medal as he earned 7.93 points in the final round. The United States' Chi Duong won the silver medal with 7.49 points. The bronze went to Turkey's Galip Yalcinkaya and Great Britain's Michael Pejic. For Spain's Jeong Cheol Kim, it was his third consecutive gold medal at the World Taekwondo Poomsae Championships. His daughter, Laura Kim Kim, also won her third consecutive gold medal in the female individual under 40 category division at this championships. In the female individual under 65 category, the United States' Noreen Thackrey earned her country the gold medal with 7.41 points, while Russia's Valentina Kontorina won the silver medal with 7.08 points. Spain's Catalina Hernandez Ramos and Argentina's Elba Sofia Hassler shared the bronze medal. In the pair cadet final, a Korean duo garnered 8.36 points for the gold medal, while Vietnam took the silver medal with 8.12 points. China and Canada took home the bronze medal each. In the female team cadet final, China won 8.12 points to earn their country the gold medal, while Vietnam earned 8.00 points for the silver medal. Mexico and Denmark shared the bronze medal. In the male team junior final, the United States won 8.28 points for the gold medal, while Chinese Taipei received 8.16 points for the silver medal. The bronze went to Russia and Vietnam. In the freestyle male individual over 17 final, the Philippines' Jean Pierre Sabido won 7.580 points for the gold medal, while Vietnam's Truong Phuoc Dai Nguyen earned 7.360 points for the silver medal. The bronze went to Turkey's Serdar Can with 7.280 points and Germany's Roger Kesternich with 7.260 points. In the freestyle mixed team under 17 final, China's Ding Wang, Xing Yuan Ming Da Hu and Yuqing Liu Ming Yue Wei teamed up to win 7.800 points for the gold medal, while Vietnam garnered 7.680 points for the silver medal. The United States and Mexico shared the bronze medal with 7.560 points and 7.080 points, respectively.